Â Strawberry shortcakes are one of the quintessential summer desserts, largely because fresh strawberries are so incredibly tempting when they are at their peak. The desserts also require minimal prep work, which is nice on a hot day. Taking “minimal prep work” to an extreme, you can even by pre-made “shortcakes” at the grocery store these days, meaning that a bottle of whipped cream and a pint of strawberries are the only other things you need to have a tasty dessert. Of course, I tend to think that homemade cakes are better than the store bought. Perhaps I have just had bad experiences with them, but they tend to be dry, spongy and flavorless. These shortcakes (or is it shortcake cakes? ), unlike the store bought ones just described, are moist and are tender enough to be cut with a fork. The dough uses both butter and buttermilk for a rich flavor that complements the berries and, as an additional bonus, everything comes together in just a few minutes. Since strawberries are the focus, save this dessert for a time when you have an exceptionally ripe, sweet batch at your disposal. Any kind of whipped cream will work, whether you want to whip your own, buy regular/light from the store or get creative with a mascarpone cream filling. The recipe makes 10, but the extras go well with jam for breakfast the next day if you’re not going to serve them all in one sitting. In a large bowl, combine flour, sugar, baking powder and salt. Rub in butter with your finger tips until mixture resembles coarse crumbs (orÂ pulse a few times in a food processor). Stir in buttermilk and vanilla extract until the dough comes together. Add an additional tablespoon of buttermilk if the dough is slightly dry. Drop by 1/4 cups (use a measuring cup) onto a parchment-lined baking sheet. Bake for 15 minutes, or until golden. 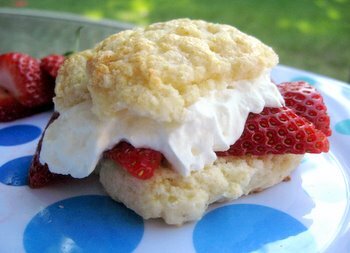 When ready to serve, slice each shortcake in half and top generously with strawberries and whipped cream. Alternatively, you could simply put out the sliced cakes with bowls of whipped cream and berries and let your friends top the buttermilk shortcakes themselves. One of my all time favorite comfort foods. I grew up eating the homemade shortcake-cake topped with berries & real whipped cream. The mascarpone cream is something I would love to try. I’m agree, strawberry shortcake is my all time favorite desserts! I also think buttermilk is the ultimate ingredient for baking, so this recipe is right up my alley. Thanks for sharing! hello, i came across your website whilst i was surfing around, and you have some fantastic recipes! I especially love your One-Bowl Buttermilk Chocolate Cupcakes. Is it ok if i use them on my blog with links to here? The strawberry shortcakes look delicious too, by the way. This sounds really easy and looks great! I use to eat this desert all the time as a kid, definitely a comfort food! Hi! I’m a recent addict to food blogs, and a long-term lover of food. My mother and I were looking for something interesting to make for dinner/desert today and I found this, and we decided to do it. Well, it was a delicious hit! The shortcake biscuit was DELICIOUS and the strawberries we got were soooo excellently sweet and juicy to where they complemented the biscuit perfectly. The cream was an added bonus. Perfect recipe, thank you so much! I LOVE biscuit-like shortcakes! The sponge cakes just don’t do it for me! I think the biscuits are much better at soaking up all the glorious strawberry juice! I’m hitting the Farmers Market tomorrow a.m. and if the berries look good, I see some of these in my near future! This is an EXCELLENT recipe!! I just made a double batch and did an 9 x 12 pan style instead of doing the biscuits… it turned out GREAT and everyone LOVED it!! FIVE STARS!! Just tried these and they came out ABSOLUTELY DELICIOUS!!!! I made my own buttermilk with lemon juice and milk, but other than that, stuck to the recipe. It’s really hard to find good recipe without egg in them, thanks for this delicious recipe!! Individual Strawberry Clafoutis | That's Cooking!